You can celebrate Mama Mia in the Greek Islands; beginning in May, 2019, Star Clippers will pay homage to the beloved romantic comedy Mamma Mia with their new “Mamma Mia Highlights” sailings through the Greek isles. This seven-night itinerary, sailing round trip out of Athens, will visit several of the islands where Mamma Mia—as well as the highly anticipated Mamma Mia 2—were filmed. A verdant island blessed with olive, almond and fruit trees. As you sail into the bay surrounding Skopelos town, it reminds you of a giant Greek amphitheatre. 120 churches nestle beneath the ruins of the Venetian castle, and two convents and a monastery cling to hills above the bay. 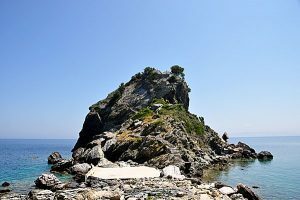 This special itinerary will also call on the island of Skiathos, where the charming Old Port was the setting for the scene where the three fathers meet for the first time, and the area around the St. Nikolaos Bell Tower was the spot where Sophie mailed her letters. Star Clippers will offer four departures of the Mamma Mia Highlights itinerary in 2019: May 18, June 8, June 29 and August 17. The most sophisticated of the Sporades, abounds with trendy shops where barely-clad visitors taking time off from the nearby beaches shop for expensive wisps of clothing and jewelry. Go a few blocks inland and you’ll find charming flower-decked houses and gardens overflowing with fruit trees. Discover the stunning beauty of the Greek Isles with Star Clippers! The Northern and Southern Cyclades islands offer some of the most spectacular scenery in the Aegean Sea meant to be seen from a tall sailing ship. Carrying only 170 guests, the Star Flyer visits the iconic ports of Mykonos and Santorini, as well as off-the-beaten path places such as Spetsess and Amorgos. 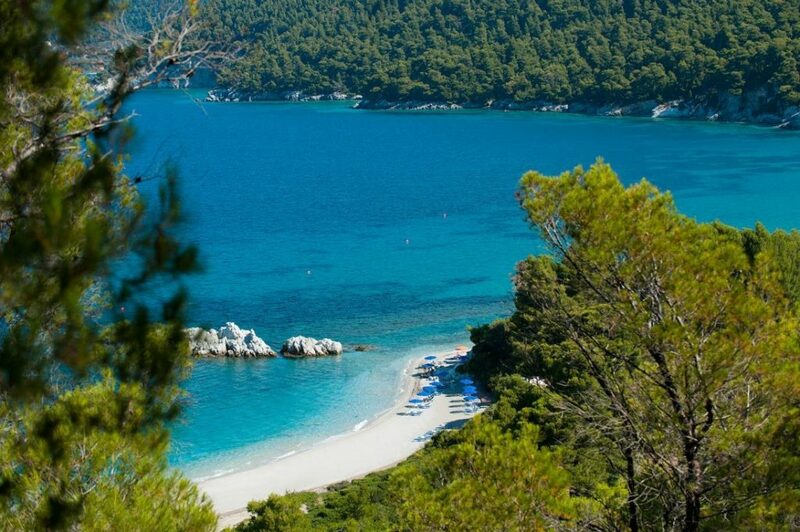 Stroll along the tranquil beach on Elafansios and admire the blue-green waters. Discover Hydra as you walk along the waterfront as history unfolds in every picturesque winding street. Visit Patmos, known for its rich history and monasteries. Star Clippers offers sailings visiting the majestic beauty of the Northern and Southern Cyclades in May through August 2019, roundtrip Athens. Experience the splendor of the Greek Isles on an authentic, tall sailing ship. Carrying only 170 guests in pampered comfort, the Star Flyer is a four-masted sailing vessel with spacious accommodations and expansive teak decks reminiscent of the golden age of sail with modern touches including two swimming pools. Relax in the bowsprit where dolphins frolic in the waves beneath, enjoy gourmet dining prepared by Michelin trained chefs and take advantage of the complimentary watersports. Sixteen sails billowing in the wind let all who come aboard know they are about to embark on a unique adventure. Life onboard is blissfully relaxed, much like traveling on a private yacht. For those who cannot wait until 2019 to experience Star Clippers, there are a few staterooms available in August 2018 to the Northern Cyclades. Call me to reserve to reserve your stateroom now.